Last Thursday, as I was putting away yet another half-read self-help book and vowing to never read another one, I had an idea for a photo. I was eager to go ahead and make it that morning, but I was taking my parents out to a bird watching place later that day, so I decided to attempt it the next day as a birthday present to myself. My birthday dawned a rainy, rainy day, as in it rained from the time I got up at 5:30 Friday morning till noon Saturday. The idea behind this photo I had in my head was based on a goal I have for this year, which is to relax and read more, and not just books on photography. I drove to the library after lunch, checked out a ton of books (yay!) and then came on home to get to work on the self-portrait. 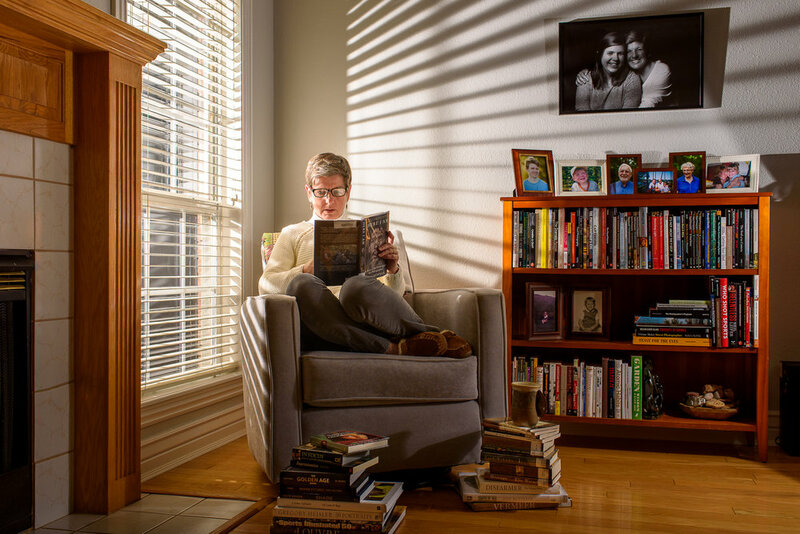 I knew I wanted an “early-morning-sun-streaming-in-the-window” feel to the photograph, so I set up a bare flash and set it to half power, angling it to point in towards the book case (and thank goodness that we have a covered porch to protect the light from the rain!). I then ran back inside and set to work on the rest of the picture. I was using my Nikon D750 with my 35mm f/1.8 lens and my tripod; then, at about 3:00 (I like to position my lights as on a clock face), I had the second light pointing back towards my chair modified with a small octabox without the diffuser since I wanted a harder light rather than a softer light. I set that power to 1/32 power because I was also using it as more of a fill light. My camera settings were ISO 160, f/5.6, 1/250 sec. I then grabbed my phone to use as a remote, curled up with my book and took the picture. And lo and behold! My idea worked the first time! And then it was time to open birthday presents and eat birthday cupcakes. But it was fun making the sun shine on a rainy day. That’s the joy of photography for me, thinking of an idea, trying it out to see if it works and getting excited when it does. I only hope that this year more ideas will come to me and that they will work just as well as this one did.